Living the Sweet River | .WE.ARE.GNOMADS. The end of our holiday trip brought us to Lago Izabel (Lake Izabel) and more so, El Rio Dulce (The sweet river) which led us right to the town of Living…ston. Yes, a town named Livingston in a Latino country. After that we zipped on over to the agua caliente section of the trip. Hot water drips right from the lime filled ground into the water at the edge of the river. It is like taking a bath in rotten eggs. Oh, didn’t I mention there is a strong sulfur smell there too. We pulled over to put our feet in, have a coconut to drink and hang out. We bought this cool hand made paper bowl for around $2.50 too! After that we zig-zagged through the snaking river between vine covered cliff walls. It was very scenic with the birds were flying low and fast besides us. And yes, we actually got on another boat ride, but low and behold we were not done with the boat rides yet. After this particular 2 hour boat tour, we ended up in Livingston, Guatemala’s very own Garifuna village. We spent an afternoon and evening in Livingston and enjoyed the laid back lifestyle. We first sat and just watched life go by. Then we gathered up enough motivation to shop for a hammock. Although we did not find our favorite material and color, we got a nice for a really great price. All the negotiating worked up an appetite so checked out a few different places to eat. In the midst of this checking out, we came upon a group of people, some of them dressed rather strangely. It was yet another Kings Day Celebration. People of all ages dressed in bright, sparkly, and even shredded costumes with their faces hidden behind a mask and elaborate hat. The beat of the drum accompanied by singing started the “show” off. People joined into a circle with the “Kings” on the inner ring. One king would dance, doing very fast paced footwork. After a bit, he would slow down, back out and then it was the next Kings turn. I think there were 10 Kings that danced and when they were done, they moved on to their next location. They did this all over town, gathering up more followers and admirers at every stop. We just wanted a dinner, but we got a dinner and a show. We had to bow out of the Kings Day celebration in order to full-fill the dinner part of the evening. In honor of local tradition, we tried the local tradition, Tapado, a stew made from seafood, coconut milk and coriander. There was a fish tail hanging over one side, a crab claw sticking straight up, shrimp curled up along the side and clams resting on the bottom. It is was as tasty as you can get. We had an early morning, yes, boat ride to catch, so we called it an early night. Slept well and we were ready bright and early the next day. We did not get anything to eat, but saw a wonderful sunrise as we waited for our 7:30am boat to Puerto Barrios. The boat ride was the calmest so far and what was great about it, the others on the boat were actually commuters on their way to work. How cool is that? 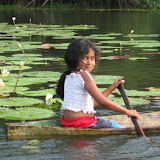 We were not in Puerto Barrios for long as we got picked up by a collective for a ride to the Guatemala / Honduras border. This border crossing was much less eventful than the Belize / Guatemala one, but this time we did pay the $3.00 the immigration worker wanted, but she had paperwork posted on her window to prove the validity of the request, uh, we think that is what it said! The collectivo dropped us off on one side of the border. We walked to the immigration window, got a thumbs, and then walked to get a bus to Omoa, where we planned to stay a night. We got to Omoa after a very bumpy 2 hour school bus ride, got out, and got something to eat quickly before the grouchies came on. Sometime during lunch, we decided to jump back on a bus and just get back to La Ceiba. We were tired of traveling and making our last day of it a long one, 12 hours long, was not too smart. But low and behold, at least the rest of the bus ride, the next collectivo ride, the last bus ride, and the final taxi ride home were all uneventful! We were “home” in La Ceiba and very happy about it! It is nice to have a home. ~ by HenderBalz on January 16, 2009.